In the night from April 30 (Queen's Day) - May 1st 1999, the then 16 years old Marianne Vaatstra was raped and murdered while she was traveling home by bicycle after a night out in Kollum. The crime was committed near Zwaagwesteinde, a small community in the rural north-east of the Netherlands . Investigation of the crime scene led to the discovery of a DNA trace on a cigarette lighter that probably belonged to the perpetrator. Entrance of a DNA collection point where volunteers donated buccal swaps. The case was highly controversial in the Netherlands. During the 13 years leading up to the arrest of the killer, a dozen suspects  had been apprehended and subsequently released because of lack of evidence. The case was also widely reported in the media during those years. In June 2000, the public prosecutor announced that forensic specialists created a profile of the perpetrator. ‘The murderer of the sixteen years old Marianne Vaatstra from Zwaagwesteinde is a white Western European male who presumably lives within a radius of fifteen kilometers from the crime scene’ . It looked as if a large-scale DNA investigation could solve the case. In October 2000 a well-known crime journalist sued the State of the Netherlands and demanded a large-scale DNA investigation. The court dismissed his demands. After 12 years (April 2012), a change in legislation in the Netherlands  finally provided the legal framework for the so desired DNA investigation; a final attempt to solve the case became a possibility . Although a man′s DNA was found at the scene of the crime, no match was found in the national DNA database of offenders. This made it impossible to establish his identity. However, the characteristics of his DNA profile lead investigators to believe he may be a local. Following a recent change in the law to allow mass DNA screening under certain conditions, they decided to screen the DNA of all males aged between 16 and 60 (in 1999) and who lived nearby. The aim was to find people who share some DNA with the offender and may therefore be related to him. It was hoped that this information would be helpful to the police to identify the killer. The samples were only be used for this investigation and were destroyed afterwards. This procedure—known as ‘familial DNA searching’—is being carried out by the Netherlands Forensic Institute (NFI), who believe that the operation may be the biggest operation of its kind done anywhere so far. 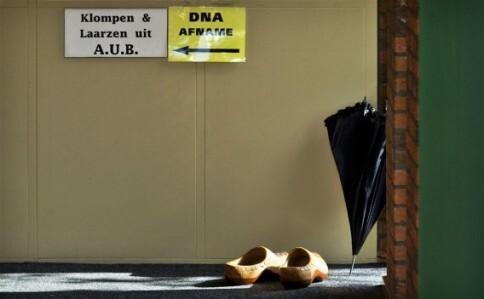 On September 6, the justice department announced that 7,300 men from the crime scene area (Zwaagwesteinde and some villages in the vicinity) were asked to donate their DNA. More than 6,500 (89%) of the men asked were willing to contribute their DNA for a procedure which is called ‘familial DNA searching’. These DNA samples were loaded into the Bonaparte database. After a little more than half of the anonymous samples had been processed, a match was found  by Bonaparte. The second DNA analysis of buccal cells from the suspect, which was carried out as a check, confirmed the match. The mass DNA screening was immediately terminated after the match was re-confirmed. The follow-up investigation by the Public Prosecution Service and the police lead to the arrest of a suspect on Sunday 18 November 2012 culminating in the suspect confessing the murder on December 6 . The NFI used the Familial Search capability of Bonaparte to ensure the procedure was carried out quickly. Bonaparte uses state-of-the-art mathematical probabilistic methods and database to determine quickly and accurately not only direct matches but also the sort of ‘pedigree’ matches against partial and full family trees required in the Vaatstra case. Bonaparte has already proved its value, having been used successfully to rapidly identify the more than 100 victims of the Tripoli air crash in 2010.